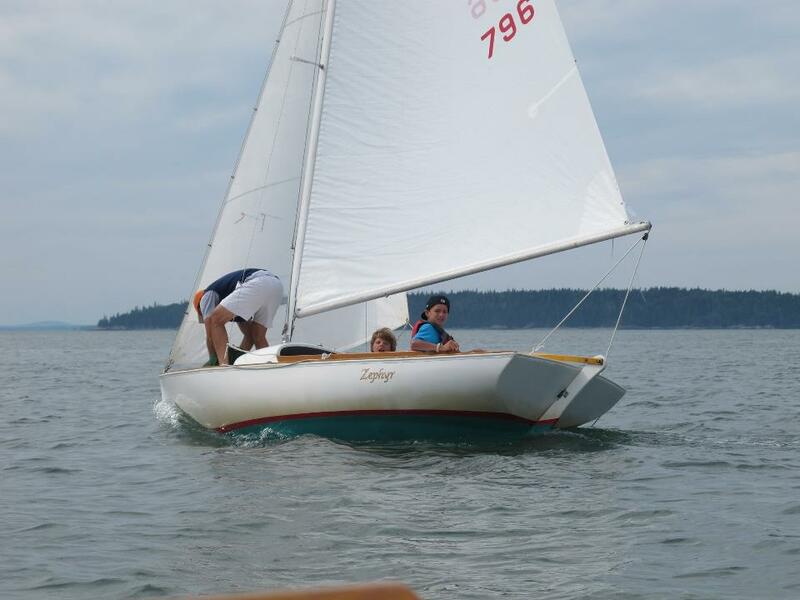 The Deer Isle Yacht Club has a long history of small boat racing, The purpose of the club has always been to promote small boat sailing and to instruct juniors in this sport of sailing, rules of the road and seamanship. From the early days club members could be found racing Wee Scot’s outside Sylvester’s Cove. In the 1960’s the wooden hulled Wee Scott gave way to the Nathaniel Herreshoff designed fiberglass Bullseye. Today our fleet numbers close to 20 family owned Bullseyes. This famous little boat was designed in 1914, and has been modernized as to rig and construction being built of fiberglass. The Bullseye is noted for its ability to take rough water while being lively and interesting to sail. The boat handles easily, points well and is exceptionally seaworthy. Flotation is provided in the airtight molded cockpit deck. With her spinnaker she provides the challenge of a larger boat, thus giving the junior sailors of the club, and the seniors too, much valuable experience in sail handling. Our club continues the racing tradition each August with the Bullseye Championship Series. This annual three day event has tested our members skills in all kinds of conditions. Weather permitting the series consists of 12 races on a windward leeward race course. With best and worst finish thrown out. Many years you can find three generations of family racing.